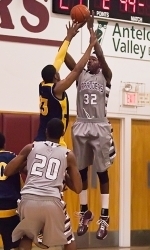 Dewayne Dedman, 6’11”, 255 spent one year as Antelope Valley College. He had little basketball experience prior to his one year at AVC but his athletism and size was enough to have Universtiy of Southern California(USC) sign Dedman. Dewayne will be a sophomore and he may be a key cog in USC’s team next year. If Dewayne continues to improve in the next years, he could be NBA bound. Dewayne Dedmon has decided to apply for the NBA draft in 2013. Dedmon was not drafted during the draft. Dewayne has been playing the D- league in Santa Cruz, CA. He was brought up for three weeks with San Francisco warriors. According to USA Today, the Golden State Warriors have agreed to terms on a partially guaranteed deal with rookie forward Dewayne Dedmon, agent Mike Silverman told USA TODAY Sports. The 7-foot, 255-pounder averaged 6.7 points and a team-leading 7.0 rebounds per game as a junior at Southern California while also leading the team in blocks and steals. But he went undrafted in June and will compete for a roster spot on one of the Western Conference’s most intriguing teams at training camp next month. Dewayne Dedm0n signs with Philadelphia 76ers. He played with the 76ers for the 20 days and was released. Dewayne was called up from the D-1 league and played 20 days for the Orlando Magic. He was signed for the rest of the year with the Magic and reportedly has a two year option with Orlando as well. Look for Dewayne Demon to have a big year in the NBA this year with Orlando Magic. Dewayne Dedmon signed a three year contract($3.1 million) with the NBA Orlando magic and played backup post players for the Magic. The Orlando Magic is looking to make a qualifying offer, worth nearly $1.216MM, to Dewayne Dedmon, too, according to Josh Robbins of the Orlando Sentinel. Orlando is working to keeping Dedmon from moving to another Pro Team. Dedmon returns yearly to Antelope Valley College to put on summer youth camp for Antelope Valley Youth.